McIntosh unveils trio of new products at CES 2016 | What Hi-Fi? McIntosh has a new AV processor, streaming audio player and a wireless speaker on show at CES 2016. 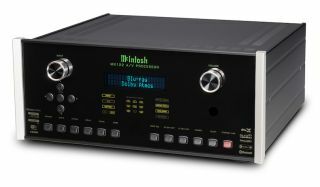 All feature McIntosh's iconic design. First up is the MX122 AV processor which supports Dolby Atmos and will have DTS:X and Auro-3D support added at a later date. It can run 3D surround configurations up to 7.2.4 and handles Dolby TrueHD and DTS-HD Master Audio soundtracks. The processor can also handle 4K sources and upscales lower resolution content to 4K quality. All seven HDMI inputs and three outputs are HDCP 2.2 compliant and support HDR too. Music stored on a NAS drive or server can be streamed to it too via either a wired or wireless network connection, including DSD64 files. Bluetooth and AirPlay are also onboard for wireless streaming from mobile devices. The MX122 is available to order now and should be available later in January for $7000. The MB50 streaming audio player meanwhile comes packing DTS Play-Fi technology to play back music over an existing wi-fi network. The player can be connected to a hi-fi system via analogue or digital outputs and is controlled from an Apple or Android mobile app, or a Windows desktop app. Connections include digital coaxial and optical inputs, as well as USB and one pair of unbalanced stereo inputs. As for outputs, these include one pair of balanced and one pair of unbalanced stereo connections, plus digital coaxial and digital optical sockets. The app comes with streaming services built-in, including Spotify, Deezer and Tidal. The MB50 is available to pre-order now and will be available from March for $2000. Finally the RS100 wireless speaker also features DTS Play-Fi technology and so can be connected to a wireless network and controlled with the same app as used with the MB50. Up to 16 RS100 speakers can be paired together to create a multi-room system and with the Play-Fi app installed on multiple devices, different songs can be streamed to different speakers or rooms. Behind the front grille is a 4in long-throw woofer and 3/4in Titanium dome tweeter. The speaker also has a 3.5mm auxiliary input and subwoofer output. The RS100 is available for pre-order now and will be available from March for $1000.